The bistro was located at the ground floor of a HDB block, which was about 2-3 bus-stops away from the Ang Mo Kio MRT station. The bistro was decorated in an industrial look. 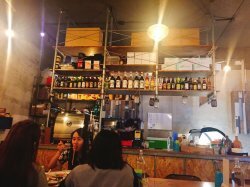 Besides the usual drinks, waffle and ice cream, it offered a range of pasta dishes and burgers, as well as, bottles of craft beer. 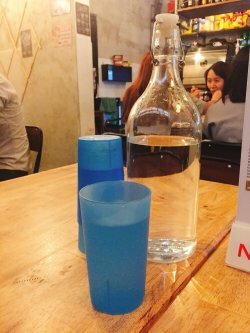 On every tables, there was bottle of water to help yourself to. Remember to collect the cutlery and condiments at the counter after making payment. Cash, NETS, and credit cards were accepted as payment here. 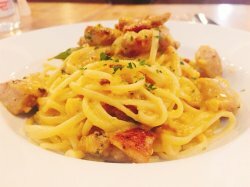 Linguine with grilled chicken tossed in raw salted egg, curry leaves and chilli padi. The pasta was a bit too overcooked and was too mushy in texture. the salted egg was rich and thick but a bit too bland itself. The grilled chicken was well flavoured and seem to overpowered the salted egg flavour. I had it served with Earl Grey with Fig ice-cream and topped with maple syrup. I remember the staff told me that ice-cream without "*" on the tag was considered classic and Earl Grey with Fig was one of those, yet I was charged $9.50 for it. Interestingly the waffle looked more green than blue when served. 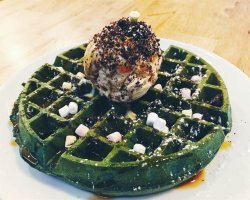 Maybe it should have been called green velvet waffle. The waffle was crispy on the outside but had a dense and chewy texture inside. Not the airy light type which I preferred. Compared to my last visit, the place looked much crowded than before, even on a weekday night. Maybe because the menu had gone through a change with much interesting items onboard.